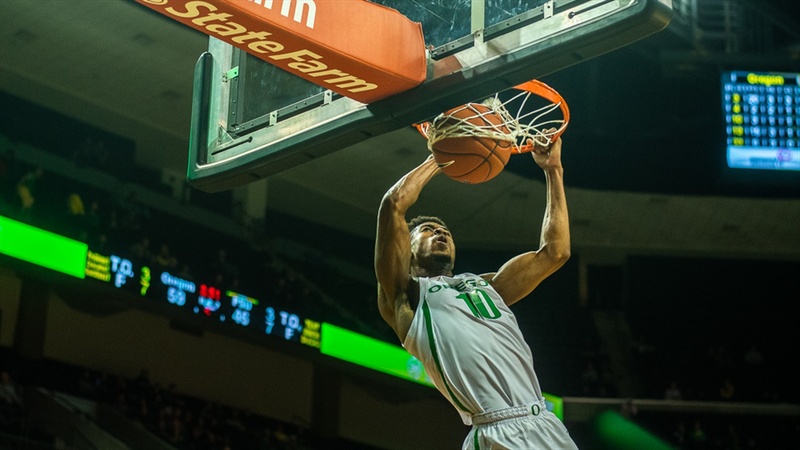 Oregon men’s basketball started the season off against their neighbors to the north, the Portland State University Vikings. Things started off sloppy for the Ducks, who struggled to get the ball moving on offense and especially struggled on the defensive side of the ball. In the end the Ducks were able to separate and pull away starting the season with an 84-57 win over the Vikings. Here are my two biggest takeaways after Tuesday nights game. Oregon has one of the tallest, if not the tallest, teams in the program’s history anchored by a 7’2” center and yet the Ducks were out-rebounded, 41 to 38. I think the Ducks came into this game a little too cocky about their size and they got punished for it, the Vikings were able to get a lot of second and third chance opportunities. People will want to blame this on Bol Bol and while he deserves some, he doesn’t deserve all of it. He led the team with 12 rebounds. This failure lies on all of Oregon’s big men, Kenny Wooten, Paul White and Francis Okoro, who accounted for 11 total rebounds combined. I think you can chalk this one up to opening night jitters and lack of chemistry so I’m not to worried about this continuing on in the season. Dana Altman will get this ironed out. I also saw some people saying that Bol Bol wasn’t playing with passion or heart, and I wanted to say from what I saw, that isn’t true. The kid has heart. Here is a problem that I don’t think will be as easily fixable as the first problem. Oregon really struggled to move the ball on offense against Portland State. The Vikings played a full court press from the first play of the game and it jammed Oregon’s offense the entire game. Another problem that contributed to this was the fact that Payton Pritchard and Will Richardson were the only two Ducks that looked remotely comfortable moving the ball up the court. Ehab Amin and Paul White were the next two closest, but against better competition I'm not confident in their abilities. Pritchard is a true floor general and Richardson is developing into one but they need to be on the court at all times for Oregon’s offense to be effective. The other issue on offense came when the Ducks got past half court and turned the ball over after silly miscommunications. That will hopefully resolve itself once the team gets used to playing with each other. As we expected, this young group of new players will need time to gel and work out some of the kinks.